Most of the camera is the same as before when it comes to body shape and usability, the higher frame rates are identical as the 2017 RX0 Mark I with essentially the same resolution and time recording. The big improvement comes in the screen and internal 4k recording with stabilization which seems to be directly aimed at vloggers. The sensor is, however, a tad less crowded by pixels at 15.3MP on the Mark II vs 21MP on the Mark 1. That should help in the low light department. As you can tell from the sample at 500fps which is 1,676×566 resolution and then saved up-resed to 1080p we have the same quality as the RX0 Mark 1 of 2017 since they share the same exact slow motion specs. We do have an improvement in color science with the Slog2 and the larger 15MP vs 21MP pixel pitch sensor does output better video quality with less noise and artifacts. The AF is also handling face recognition and eye AF now with much better hit rates which should work well for stills, however, the video review below shows a lot of misses because once focused video continuous AF is not available in the camera. That is right the camera does not AF in video mode probably due to battery saving. Too bad and a big miss! There is also a shorter minimum focusing distance from 20cm to infinity from the Mark 1 50.8 cm to infinity which is a big difference if you want to do Vlogging. Should I get it instead of the RX0 Mark I? It is a hard call to upgrade if you already have the mark I and are not interested in the flippy screen and the 4k internal recording. Both cameras shoot identical slow motion if that is your intent excluding the supposedly better low light quality from a 15.3MP sensor vs 21MP on the Mark I. The screen, however, is a game changer in order to use it without external monitors or portable devices for remote operation. RX0 Mark II should be available on April 9, 2019. Pre Order is available now at Amazon! Considering it is only $100 more for the new model there is no question the RX0 Mark II is the winner of your money here. The lack of Video AF should worry Vloggers that want to use it as an all-rounder camera except if they set the focus at 20cm to infinity and do not hope to get closer shots. That should work well to keep things in perfect focus like what a GoPro is able to show. We like this camera for its compactness but the 30min rec time on the small battery should be something to think about if you want to use it as a main travel camera. Expect to get an external battery solution or a handful of batteries for this little large sensor action cam. Previous PostGalaxy S10 Slow Motion Video Samples!Next PostChronos 68 Posted by Krontech, April’s Fools or legit? I assume that the SONY RX0 has an automatic exposure control that selects the shutter speed. What is the fastest shutter speed that the camera will select in bright sunlight? High speed video samples of slowly moving objects, such as water flowing or water balloons breaking, are useless for estimating motion blur from the blur of moving objects. 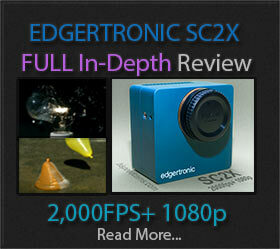 For high speed video cameras, I would always like to see the fastest shutter speed spec for a camera presented. 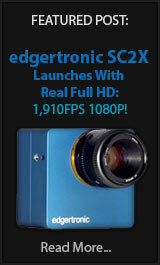 This important spec is rarely available for high speed video cameras. 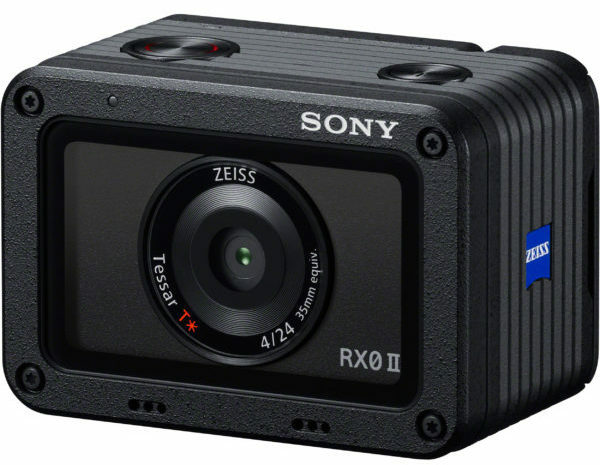 All Sony RX cameras have an anti distortion shutter capable of 1/32000 sec. This eliminates rolling shutter artifacts under that speed which is why the stacked sensor tech used here is so good compared to other CMOS tech. This however is no substitute for a real dedicated slow motion camera. I am looking forward to all the tests where this camera and the Gopro Hero 7 black will be compared side by side. The price in Europe for the mark II will be more than two times the latest Gopro black and I am wondering if this difference in price can be justified by image quality. I like the idea of a small and robust camera and the option for recording on an external drive, as implemented in the first version, is perfect as long as it is possible to reach out to impressive specs. But 4K 30p and its slowmo specs are so 2015. I wouldn’t get my hopes up, we still have to see a real improvement in the Sony Motion Eye to get out of this older technology. 1080p 1000fps is needed in real resolution even for a couple of seconds to be really a game changer. RX0 II is a better camera but evolutionary not revolutionary. Thanks for commenting Klaus!